The Art Deco Stage Proscenium Dressed for a Conference. Imagine a 1.5km plot of land surrounded on one side by a 1.3km long beautiful sandy beach, an entrance arch 40 metres high and 36 metres wide so grand that the main road has been re-routed to pass underneath it, a lobby and atrium area that sits under a dome larger than St Paul’s Cathedral topped by a 2 metre finial covered in 20kg of solid gold, and 100 hectares of grounds so plush an ‘army’ is required to maintain them. Then think 7-star! Yes 7-star. The Emirates Palace Hotel is Abu Dhabi’s only 7-star hotel built on the Corniche to provide an exclusive residence for visitors to the emirate. Our report details the involvement of UK-based LSI Projects who provided the lighting and stage engineering systems for this truly unique complex. Trusses During Installation showing Flip Flop Trays. LSI Projects first became involved with the Emirates Palace Hotel project in 2001, and again in 2003, winning the international tender for Package 13b, the production lighting and stage engineering systems. These are located in the magnificent art deco style auditorium centrally housed in the entertainment complex, strategically placed between the two lavishly equipped hotel buildings. The whole project has been rumoured to have cost £2 billion and officially opened on 7th March 2005. The technical specification was prepared by Jerry Godden and his team at Theatre Projects Consultants. The brief was to provide conference and theatre facilities that would enable large corporate clients to stage international conferences and product launches as well as local facilities for the Emirate of Abu Dhabi. 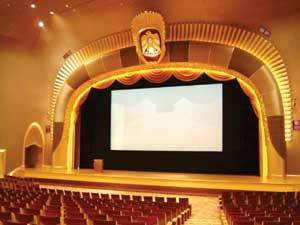 The auditorium can accommodate around 1200 people in very comfortable seating surrounded by lavish décor. The late arrival of Theatre Projects into the design team accented the need to solve a number of problems as the building works had commenced prior to their appointment. One such problem was of the limited load capacity of the roof structure and access to the installed system. Consequently a system of motorised lighting trusses were devised that would be suspended via chain motors from the steel roof beams located some 22 metres above the stage floor. 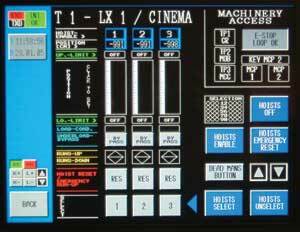 ARC Touch Screen for Film Screen/LX1 Control. The stage engineering involves a system of chain hoists and trusses from which adjustable masking and stage lights are suspended, plus a framed flown film screen unit, motorised house curtain, flown acoustic reflector ceiling panels and rolling acoustic towers, fixed and movable curtain tracks with stage draperies and masking. The trusses were designed to carry the lighting equipment, stage curtains and masking, together with a complex set of acoustic reflectors containing a concert lighting rig. The acoustic reflectors are suspended on three trusses and include adjustment to allow them to be angled. Ceiling panels made of fibreglass, manufactured by Wenger Corp of USA, together with the 11 free-standing stage towers provide an acoustic shell that can be deployed around musical performers. With the shell in place the performers can hear themselves and the music is reinforced and blended before it is projected into the audience. The panels are suspended from arms attached to trusses and chain hoists. When not in use the panels are lowered to stage level and rotated manually to a vertical position before being raised and stored within the upper area of the ‘fly tower’. Flip flop tray. ADB Phoenix 10XT lighting console. When in use, the panels are lowered and rotated to an appropriate angle. They house orchestra lighting with mercury switches to turn off when tilted, fed via a unique LSI-designed flip flop type cable management system linked to termination boxes located on the upper steel roof beams. The panels incorporate a pipe at the rear from which masking borders can be hung. 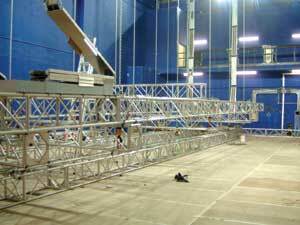 A total of 10 motorised truss sections, each 22 metres long, have been provided. LSI selected medium duty truss from Total Fabrications, having previously worked with the company successfully on a number of large scale projects. Three trusses house the over-stage acoustic reflectors. One supports the film screen and associated masking, which also acts as the No 1 electric. Three support the three further over-stage lighting bars. One supports the rear curtains or cyclorama cloth, and a further two form side trusses for lighting and curtaining. Each truss is suspended from the very latest generation of Liftket motorised chain hoists, each rated to carry a working load of 1250kg. A total of three motors are provided for each truss due to the average lifting load requirement of 1000kg per 22 metre truss. As the system is likely to be used by a wide variety of personnel it was felt that the highest level of safety should be in-built within the system. The Liftket SB 8.2 motors feature a lifting speed of 4 metres per minute, two independent DC brakes, a sliding clutch for overload protection, and an encoder for positional control together with operational and under/overload sensing. The motors are fully compliant with the new BGV-C1 that replaces the VGB70 standard. This standard, developed in Germany, covers the requirements of a suspension system over an audience. Use of these motors allows the trusses to be suspended without the use of additional safety devices such as load arrestors. 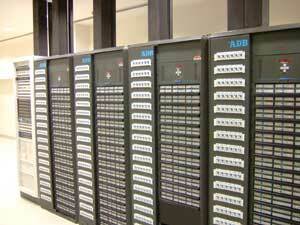 The motors are controlled from a central control system using LSI Project’s developed ARC control system. ARC is used throughout the auditorium for controlling working lights, house lights, non dims and the stage engineering system. The ARC system allows each truss to be selected and then lifted or lowered to a specified height via the wall-mounted touch screen or via a remote blue tooth driven control panel. All motor control panels are only operable when a dead man’s handle is held on by a second operative. The touch screen reports fault conditions as well as detailing actual height measurements. The ARC system limits the number of hoists that can be moved simultaneously in order to restrict the dynamic shock load on the building steelwork. Sets of black and red curtains are provided so that the stage dressing can be matched to stage different events. 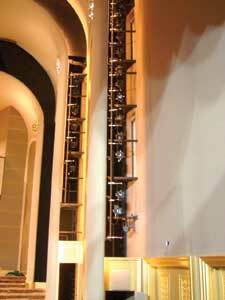 Curtain tracks were provided by Hall Stage with electrically operated tracks controlled via the ARC system. The lighting system is designed to provide high levels of illumination from what will probably be a relatively fixed rig. 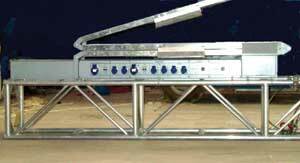 Over the stage four lighting trusses are provided. The luminaire stock comprises of 30 zoom and 60 fixed beam cool profiles, 30 ADB C103 1.2kW Prism Convex fixtures, 12 ADB SH20 2kW TV wide angle Fresnels and 60 Thomas Parcans, with the cyclorama illuminated by 18 of the popular ADB ACP1004 cyclorama floods. 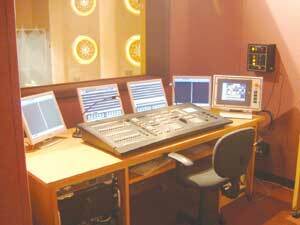 ADB Phoenix 10XT lighting console. With a 22 metre truss width, a total of four six-lamp bars are provided for each truss. On these trusses two flip-flop trays are provided to carry the necessary DMX data, Ethernet, WorkingLights, 3kW Non Dim supplies and 3kW and 5kW dimmed supplies down to the socket boxes fitted at the base of each flip-flop. The dimmed outlets appear on Socapex outlets for 3kW dimmers and CEE 32 Amp for 5kW split down via MCB’s to 3kW CEE outlets. A quantity of Chroma Q colour scrollers and power supplies are provided for use on the stage as well as front of house luminaires. Dedicated front of house lighting positions are provided and these are built into the auditorium ceiling and accessed via catwalks and technical corridors. With such a high and shaped ceiling, care was taken to ensure that the long projection distances would still allow high levels of light to illuminate the stage. Side lighting positions were achieved by carefully designing the booms to be flowed into the room shapes. The bridges are equipped with a combination of 1.2kW and 600 watt zoom profiles. ADB Eurodim 3 Dimming and Non Dim System. The lighting control system is centered around an ADB Phoenix 10XT lighting console with facilities for generic and motorised luminaires. The system is equipped with four visual displays to ensure the operator is rapidly fed with all the necessary information. A tracking Phoenix RB back-up system is provided together with an extensive ADB Ethernet network with outlets throughout the installation. The control system links through to a complete ADB Eurodim 3 modular dimming and non dim system housed in a purpose built dimming and electrical room located above the auditorium ceiling to keep cable runs to an acceptable length. A total of 288 x 3kW and 36 x 5kW dimmers with 24 x 3kW Non dims are provided, and these are housed in four Eurodim 3 cabinets. Also housed within the dimmer room is the network rack allowing Ethernet and DMX patching to be carried out. LSI’s project manager was Andrew Nu who supervised a team of primarily UK personnel with some local support brought in to complete the installation. The project took some 15 months to complete and this period included all local submittals and staff training. The finished system delivers a highly flexible solution that matches the opulence of the auditorium and total complex, delivering a conference and theatre facility that rivals others around the world.